Nduja is a soft, spicy hot, spreadable salami considered one of the most famous, if not the most famous, of typical calabrian foods. Nduja originates from Spilinga, though great nduja can be found in all areas of Monte Poro. The name nduja comes from the french word "andouille", which means "sausage". Nduja is made with pork meat, a bit of fat, salt and a lot of red pepper. In general, nduja is extremely spicy. However, for those less adventuresome souls, a less spicy version can sometimes be found (just ask). Nduja is often considered an aphrodisiac due to all of the red pepper inside, and is also great for the heart and tastes wonderful. Nduja originates from a small village (Spilinga) in the Monte Poro mountain. Nduja is a pork-based product in which ground pork is kneaded together with salt and calabrian chili pepper. The mixture is then made into sausage by encasing the mixture in the animal's natural intestinal lining. The sausage is then slightly smoked and allowed to rest and season for a number of months. Unlike typical salami, this salami is made to a very soft, spreadable consistancy, making nduja completely different from any other salami with an absolutely unique taste. The quality of the pepper utilized is extremely important to the flavor of this typical product. It is not terribly rare to find nduja that utilizes lower quality red pepper. However, one can be ensured of high quality if one is careful to select nduja that originates from the calabrian region of Italy. In Calabria, pepper is not only an ingredient; it's much more. Red pepper represents tradition, culture and history. 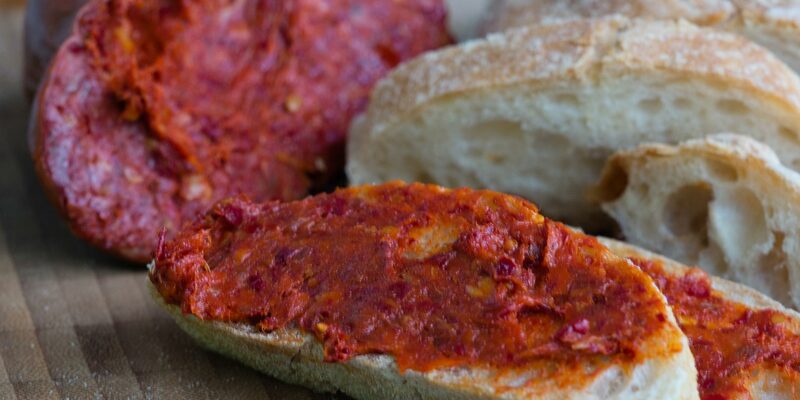 In this regard, nduja not only has high quality pepper, but it utilizes a lot of pepper as well. For this reason, someone not used to really spicy foods may have a bit of difficulty eating nduja, except in small quantities at least at first. (This is also true for a number of other calabrian products). For those who enjoy the taste of nduja, but would prefer less spice, nduja may be mixed with ricotta and then gently warmed in a saucepan. This mixture can then be used as a spread for bread, crackers, etc. Nduja can also be used to season pasta, pizzas, or anything else that takes your fancy. Ingredients (for 4 people): 500gr of penne, 1 small chopped yellow pepper, 1 minced red onion (best if from Tropea, Calabria), 1 glass of dry white wine, 400gr of tomato sauce, a pinch of sugar, 250gr of nduja, 2 spoonfuls of olive oil and a pinch of salt. Add pecorino (sheep's milk cheese) to taste. Preparation: Warm olive oil in a pan and lightly sautè the chopped pepper and minced onion. Add nduja, mix everything quickly, then stir in the white wine and let it evaporate. Add the tomato sauce and sugar and let it cook over a low fire, stirring occasionally for 15 minutes. While the sauce cooks, boil and strain the penne. Mix the sauce and penne, add pecorino, and enjoy. If you want to let us know about an event, a producer or an ecommerce selling nduja, contact us now! © 'Nduja - All rights reserved.